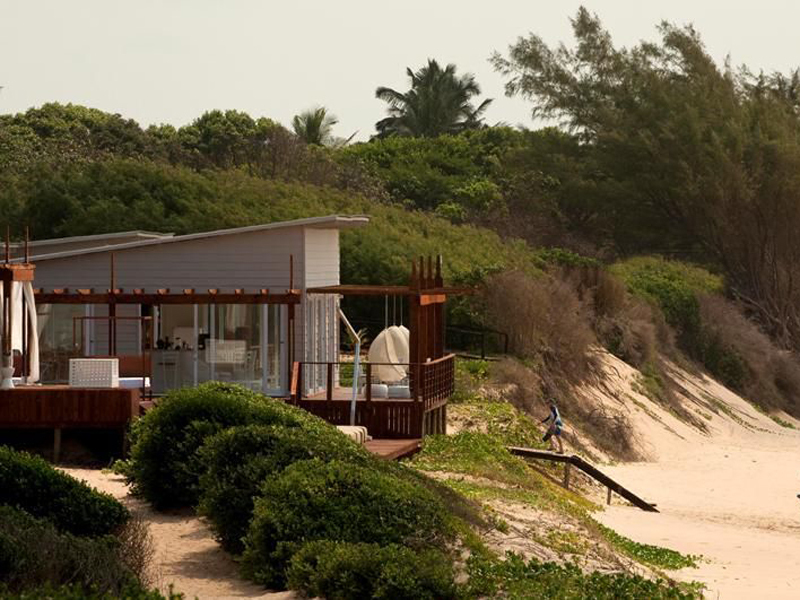 On the east coast of Mozambique, built on the edge of pristine shores and designed to provide an opulent beach escape is the White Pearl Resort. Surrounded by natural beauty outside and sophisticated elegance inside, this is the ideal place for intimacy and rejuvenation. To get there, you can drive from either Maputo in Mozambique or from Kosi Bay in South Africa – however both options require a 4×4 vehicle. Transfers to and from White Pearl Resort are available for those who don’t want to drive. If you want an experience of a lifetime, then undoubtedly a thirty minute helicopter transfer that takes you over the Maputo Elephant Reserve and along the Mozambican coastline directly to the resort is the ideal choice. Once there, this exclusive resort is designed for instant relaxation. Private chalets with a wrap-around deck epitomise casual sophistication and are furnished using white and cool blues. The open plan lounge and bedroom has two separate sliding doors, one that leads to the entrance and the other that frames the ocean view, which opens to two sun loungers next to a sparkling blue private plunge pool. The spacious en-suite bathroom also opens onto an enclosed outside shower. The resort offers an abundance of activities, so if you can bear to leave your luxury suite, the beaches provide warm days to experience all that is on offer. In the ocean you will find the very best in snorkelling and scuba-diving – exploring the rich coral reefs with many an expedition resulting in an impromptu swim with bottle nosed dolphins. Horse riding over the dunes and up through indigenous landscape is the best way to get the incredible views of this beautiful coastline. Head back to the resort for a soothing massage treatment before sipping cocktails and enjoying a romantic dinner of the finest seafood in an idyllic setting. White Pearl Resort spoils you with casual comfort combined with five star luxuries.